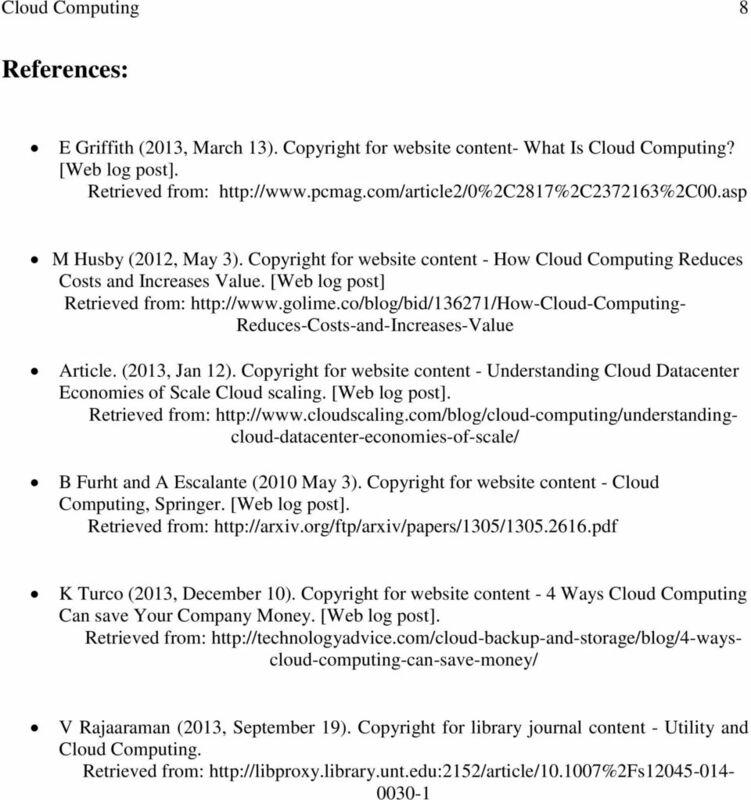 Download "RUNNING HEAD: Cloud Computing 1. Cloud Computing. 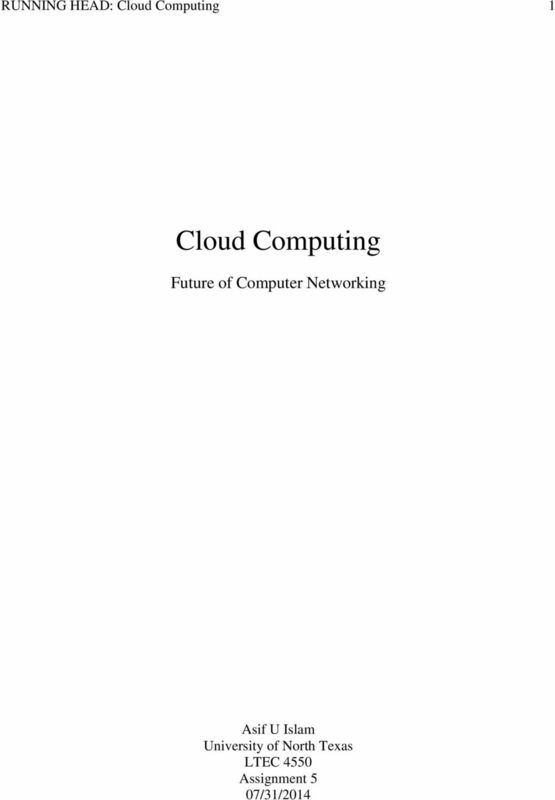 Future of Computer Networking"
2 Cloud Computing 2 Abstract The paper discusses the ways cloud computing technology use a network of remote servers hosted on the Internet to store, manage, and process data, rather than a local server or a personal computer. This paper describes the ways the cloud technology gives businesses the opportunity to reduce the amount of money they spend on hardware, software and associated infrastructure. 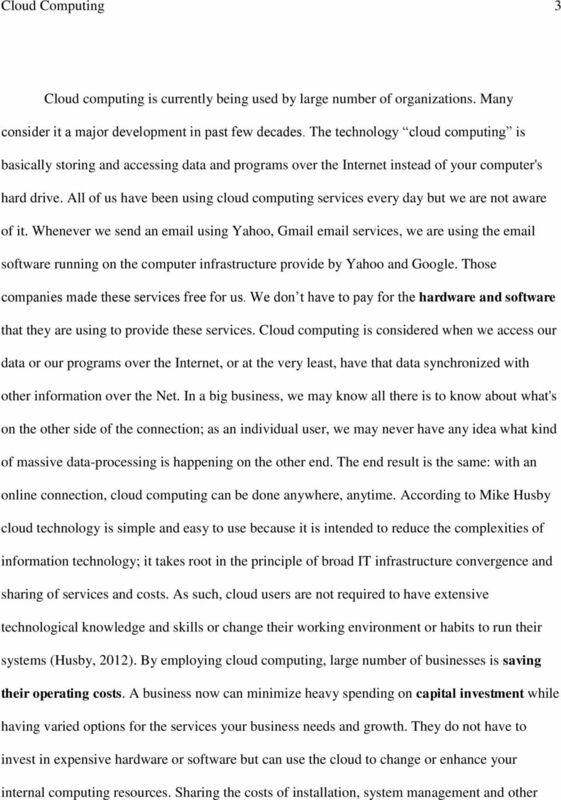 This paper also discusses how cloud computing has improved accessibility for end user to thousands of business oriented software. Moreover, this technology also benefits education institutes by allowing faculty members and students to have access to various types of software virtually. 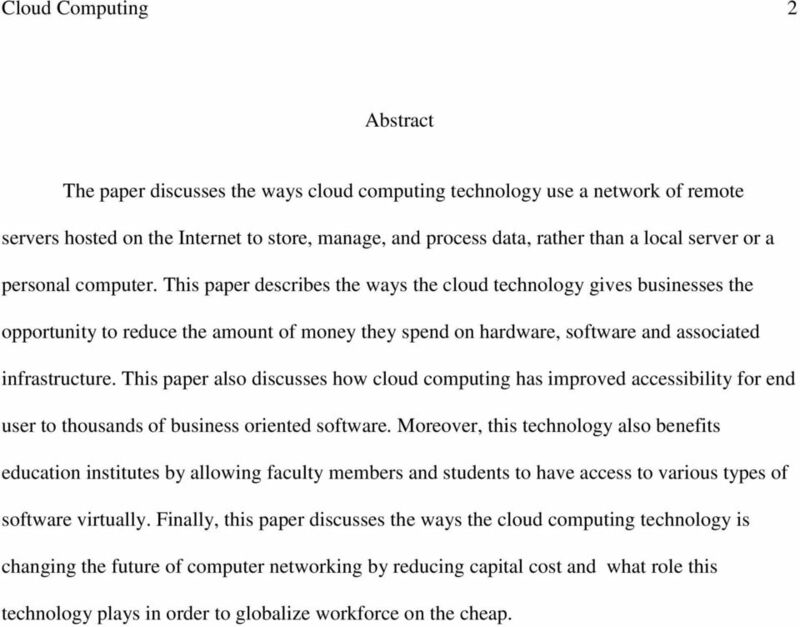 Finally, this paper discusses the ways the cloud computing technology is changing the future of computer networking by reducing capital cost and what role this technology plays in order to globalize workforce on the cheap. 5 Cloud Computing 5 hardware is located, uninterrupted power supply, air-conditioning, access control, and uninterrupted communication facility to access the hardware (Rajaraman, 2013). Basically, SaaS services runs on Infrastructure as a service but also provides other business needs. And Platform as a Service (PaaS) is built over IaaS. In this type of service the provider maintains, besides the hardware infrastructure, software infrastructure such as an operating system, programming languages, and application program development and deployment tools (Rajaraman, 2013).. Basically, the provider caters to customers requests of any systems program development environment such as.net of Microsoft or a UNIX programming environment on the computing infrastructure and provide by Microsoft called Windows Azure, Amazon s Web Services, IBM s SmartCloud and AppEngine provided by Google (Rajaraman, 2013). Moreover, Cloud solutions can also lead to a dramatic decrease in labor; as a result of the hardware being owned by vendors and stored in off-site locations, there is less demand for in-house IT staff (Turco, 2013). Eliminating routine maintenance can free your IT staff to focus on important initiatives and development. In some cases, this could even mean reducing staff size. For companies lacking the resources for an in-house IT staff, the cloud will help eliminate costly third party hardware repair bills (Turco, 2013). In addition to labor savings, cloud technology can extremely reduce cost for enterprises because of the increase in workforce productivity. It takes much less time to employ a cloud system than conventional installation for hardware and software for the same service. Finally, most cloud storage and software applications are available anywhere, through an internet connection. This is great news for enterprises that rely on travel or telecommuting policies in place (Turco, 2013). 7 Cloud Computing 7 access to their files and related software any place they have a computer and an Internet connection (Escalante, 2010). In addition, Cloud Services can work with existing single sign-on programs, and a hardware failure becomes less of a concern. 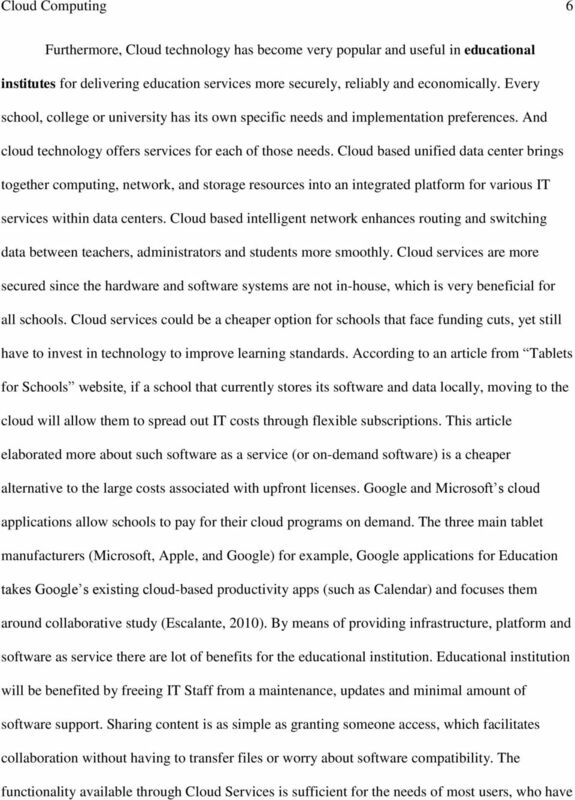 Organizations like Microsoft, Google and Amazon are providing grants and free access for Universities, Colleges, Researcher and students and the educational institutions can use the services with less effort (Furht, 2010). Therefore, cloud computing is one of the biggest development of the decade in computing. Every organization including educational institutions should have a cloud strategy on how to make best use of this new option. As we know cloud technology only exists over broadband communication. There are some risks involved of few programs only if the data is outsourced to cloud provider but large cloud computing providers are much more secured and the data is much secured. Cloud computing has changed the way we compute and because it is so beneficial, this technology will get more secured and user friendly in the near future. Keywords: Cloud computing, Characteristics of Cloud computing, Models of Cloud computing, Distance learning, Higher education. Service Oriented Cloud Computing Architectures. Asher Vitek 12/3/2011 UMM CSci Senior Seminar Conference Morris, MN. Making the right Connections. With cost savings and a yet unmeasured potential, the future of cloud computing is rife with promise and possibilities.